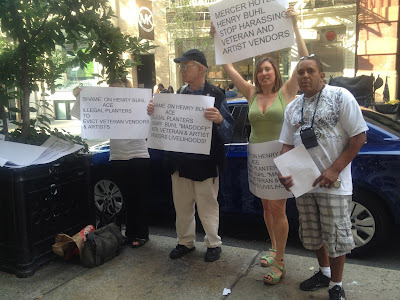 NYC Culture Pop Politics: Henry buhl protest and why I hate Apple Soho Store and Managers David and Dana! Henry buhl protest and why I hate Apple Soho Store and Managers David and Dana! The YouTube is coming and a few racist white folks that take everything for granted -- and think they could never fall like so many did from the Wall Street Implosion yelled Planters not Vendors. One woman complained the side walk needs to breathe -- but I have news for you some folks are living somewhere between a Recession and aDepression and they need work especially with unemployment being 10 percent and one out of seven Veterans homeless!!! Thanks to Deputy Inspector Winski and the First Precinct for being a no-show. I know the rich folks lean heavy on you. Thanks to the Vet NYPD officers and all the NYPD that refuse to ticket the Vet Vendors -- I remember one day you refused and Michael Rawson had water thrown out the window on to the Vet's tables. Thanks and gratitude to all of you made a difference today and a few people that I won't name or don't know your names that watch over me. Thanks and gratitude for everyone that did show up. To everyone that told me they would and did not -- thanks see you next time. Thanks so much to everyone that participated, took a flyer. Reminder mayor Bloomberg took the 2 Viet Nam Veterans to lunch for alerting the NYPD about the bomb in times square but in Soho a few rich people that don't want to walk their designed folks past Veterans that served Our Country and FYI many of the People are people of Color! I understand they want the sidewalks clear but Artists made Soho and were forced out by way too many rich greedy people with Marie Antoinette complexes. Apple Soho manger David told me to get out of the store with my protest sign immediately. The racist store in my opinion manager Dana did give me permission to use the toilet if I turned the sign around. I tell you she is racist because she once harassed me and an African American teenage boy for using the computers in the store. She was very concerned we went over Apple's 20 minute policy. I didn't but I did by a fortune in Apple products. I was wearing an American Indian blanket jacket and the store was empty -- it was a raining sleet like day with ice on the ground. Soho isn't what it used to be. I always hate the Apple store as a big corporate soulless machine unless I bought my apple computer. The Danas and Davids to make me think Apple really is terrible after all. I will continue Apple but less. I will never buy anything from Apple Soho or take a one on one there ever again. By the way there are good rich folks that are white and do care and do make a difference.